Now we are past the horrors of Halloween for another year it is time to give ourselves another fright: GOLD! I am not an expert in this commodity, just a scarred victim. From my contribution to a group therapy session with other victims, here are some notes that may be helpful to those thinking of taking the plunge. Don't. You have a little bit of money you want to invest and you buy some gold. You thought you would be swimming with dolphins, but instead you find you are treading water in the shark pond. Your cuddly new friends are going to remove parts of you very painfully without the benefit of anaesthetic. Before you dive in, some sharks will puff up the benefits of owning gold, warn of crises that are about to strike, the imminent collapse of all civilisation and social order. They will enumerate the many advantages of buying gold from them. Standing at the edge of the pool, can you feel that pleasant nibbling at your toes? The sharks will tell you that the easiest and most convenient way to own gold is to buy paper gold. You can do it online and sell anytime and there are no security and storage problems at all. Sound's good. Chomp – your leg's gone. Rule 1: Gold ETFs are not worth the paper they are printed on. You will be ripped off when you buy them or finally get rid of them. Firstly note that you, a little and insignificant person, cannot walk into a bank and exchange your paper gold for the real stuff. There is a reason for this: by the middle of this year there were about 124 ounces of 'paper gold' (Gold exchange-traded funds, ETFs) for every ounce of physical gold registered as assigned. 124 people cannot acquire the same single ounce of gold. The situation now will be worse. Put another way, your 'paper gold' is not backed by physical gold in any meaningful way. Paper gold offers no goldy-style security at all. You haven't bought gold, just some chips in a casino. All the gold markets are rigged, the paper market is completely rigged. You are playing in a casino on rigged wheels and with marked cards. The 'spot' price for gold that you can follow on many gold bullion websites is hopelessly manipulated by the big players. You, tiny thing, have no place here. The price is low, mysterious computer-driven buying takes place, an hour later the price is higher and mysterious computer-driven selling takes place and minutes after that the 'price' of gold is low again. Every transaction costs money. Those with billions at their fingertips make money. You, insignificant worm, even sitting all day, every day watching the screen and buying and selling, do you really think you are going to even cover your trading costs with the relatively minute amounts you are trading? Paper gold is just another game on the great casino floor that is financial 'services'. Physical gold, the nice shiny stuff. Physical gold comes in three forms: jewellery, coins, bullion (the last two assuming that your government even allows you to buy them). All three forms allow you to lose money in style. I know nothing about jewellery. It seems to me to be a perilous investment. Unless you are one of life's hustlers you will be ripped off when you buy it and disembowelled when you sell it. Auctioning it off is just rolling dice. Jewellers have high markups on everything they sell. You may have to wait a long time before your pieces have appreciated sufficiently to get you just the retail price back. A diamond is indeed forever: once you have bought it never try and sell it. It is true that in a completely disastrous case where you have fled from your home and now, hungry and cold, you have nothing left but a couple of gold items sewn into your clothes, you may even be happy to receive one hundredth of what you paid for them. Coins are not pure gold, the gold in them is alloyed with other metals to harden them up. Everything we have said about jewellery applies to coins, the retail mark up can be even worse than it is for jewellery. Coins can also be easily faked. They are really collectibles, not repositories of gold, and therefore the price will be reduced by the slightest scratch. The disaster scenario is the same as jewellery, but in addition you will have to prove that your coins are genuine. What a gold coin is 'worth' is a mattter between you and your maker. Rule 2: In a time of real disaster you won't be able to sell your gold. The money to buy it will simply not be there. Buying and selling gold and jewellery is an act of barter. In times when there is no money around your Cartier pendant might get you a loaf of bread. Rule 3: Jewellery and coins are nice to own, but extremely risky investments. The sharks will remove some limbs when you buy and the remaining limbs when you sell. Gold bullion i.e. physical gold in bars. Rule 4: Bullion is an alternative currency. If your everyday currency is weak or devaluing against other currencies then gold might be a useful protection for your money, as long as the gold price doesn't sink too far. But holding cash in other currencies may be a better option. Money held as cash in a few major currencies is easier to liquidate and the sharks may only take a toe or two as opposed to a leg. Gold is generally priced against the dollar, so if you live in the US the alternative currency effect is a bit simpler: as the dollar gains then gold declines and vice versa. Any underlying changes in the valuation of gold are against that benchmark. If your native currency is not the US dollar then you really have to treat gold as a currency, specifically dollars. If your currency goes down against the dollar your gold will increase in value as the dollar does and vice versa. The vice versa is important here, since if the dollar gets weaker against your currency, your gold becomes less valuable. In this sense holding gold is much the same as holding a fistful of dollars. If your native currency goes down, you gain, if it goes up – as mine did – you lose. These differences can be much greater than any change in the gold price as such. You have become a currency trader, not a gold trader. Particularly with small amounts of physical bullion (less than, say, one million dollars – yes, you are swimming with the big boys now) you will be ripped off when you buy and ripped off when you sell. The mark-ups are high and the process is very obscure. The price you pay or receive will not be even close to what the charts are telling you. If you hold dainty little bars up to 100 grams each you might – might – just get away without paying an assay fee when you sell them. However, once your gold moves into your custody the chain of provenance is broken and you will be relying on the goodwill of the dealer to buy them back without making you pay to have them assayed once more. Bigger bars than that will normally be assayed, unless you have left them in the vaults where you bought them and avoided physical possession. But such storage comes at a price and, if disaster does strike, let's see how quickly the sharks allow you to sell 'your' bars in their possession. I don't want to sound paranoid here but you have no real guarantee that 'your' gold really exists in the storage facility, whatever the sharks tell you. Rule 5: Never trust any bank or other financial services company. They are not your friends and they act only – only – in their own interest. Their probity is on display only when they think someone will catch them out. They have deeper pockets and more lawyers than you. You are trading in thousands, they are trading in many billions. The more desperate you are to sell them something, the more they will rip you off. 'Twas ever thus. Nevertheless, I am not too unhappy with my gold. For the first time in my life I had a small amount of unassigned money unexpectedly available. At the time a savings account was offering effectively 0% interest. I knew next to nothing about shares and such stuff. Since then I have had a lot more entertainment watching the lunatic behaviour of the gold dealers and price movements over the past year than I would have had with a boring old savings account. We bought a 100 gram bar for each of our children and grandchildren. We will leave this gold to them in our wills. That money is a loss to us anyway. If the bars are still a loss when a child decides to sell a bar he won't notice because he didn't buy them – they are just free money and he can choose his own moment to sell it. If you haven't spent your life collecting paraphernalia then gold bars are something a little more interesting and glamorous to leave in a will. But that's all they are. The only downside here: I can't take the bars out and stroke them. Each bar is sealed in a bubble pack with certificate. I reckon that if I break them open then selling them will not be quite so straightforward. All my gold is still not really in my possession. So near but so far away. That's love for you. 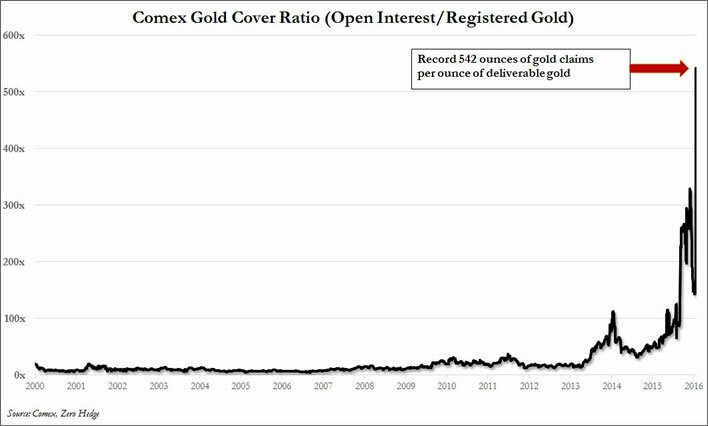 As the chart below shows – which is disturbing without any further context – the 40 million ounces of gold open interest and the record low 74 thousand ounces of registered gold imply that as of Monday's close there was a whopping 542 ounces in potential paper claims to every ounces of physical gold. Call it a 0.2% dilution factor.